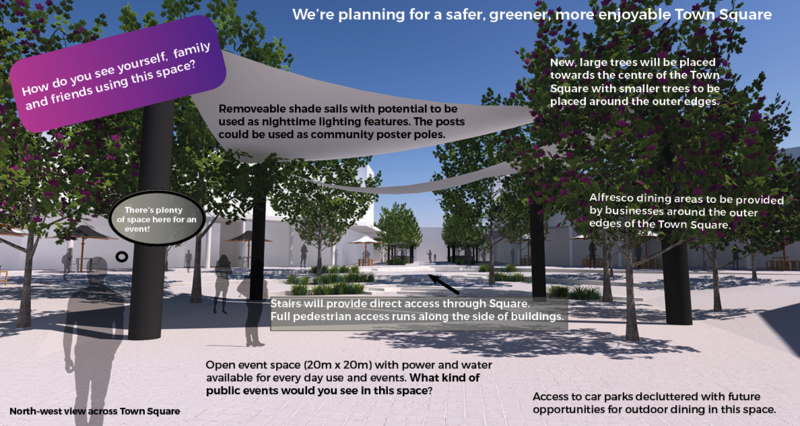 A concept design has been prepared for upgrades to the laneway between Anketell Street and Lake Tuggeranong. 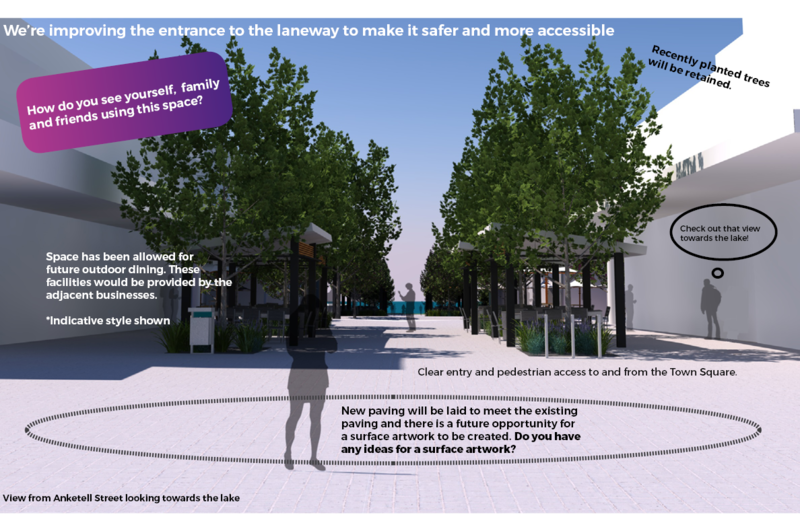 Thank you to everyone who provided feedback on the upgrades to the laneway connection to Lake Tuggeranong from September to November 2018. 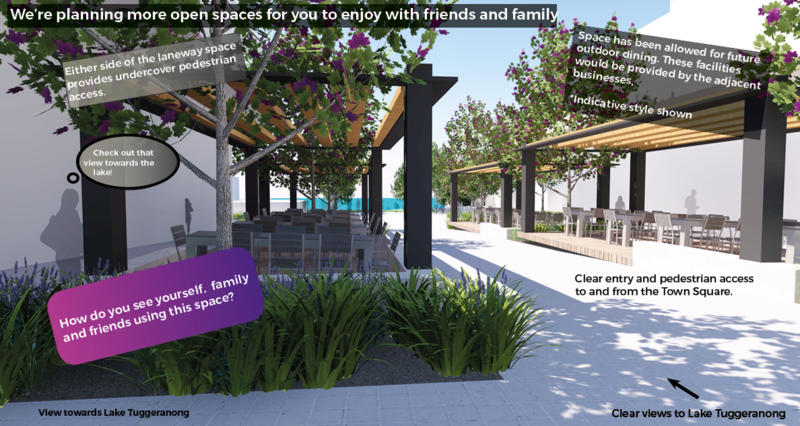 In 2017-18 a concept design for the laneway upgrade was prepared in consultation with key community stakeholder representatives including Tuggeranong Community Council. We sought feedback from the wider community to help inform the final designs. 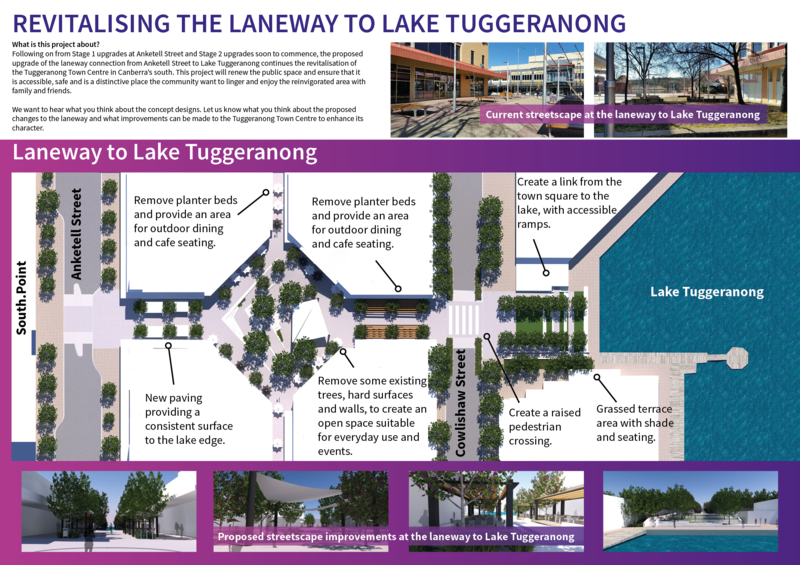 The concept design shows the broad vision for a renewed space that is accessible, safe, useable and inviting; one that re-establishes visual connection to the lake, encourages people to move through easily and safely, as well as stop, enjoy the place and bring more vitality and commercial activity to Tuggeranong Town Centre. The Laneway project site starts at the edge of the Anketell Street road corridor opposite South.Point, and continues through the Town Square, road cross-over at Cowlishaw Street and to the Lake Tuggeranong foreshore; it includes the two laneways that connect car parks to the north and south of the Town Square. The Laneway was originally designed as a civic space in the 1980’s but no longer suits the needs of a growing Tuggeranong Town Centre. It is cluttered, worn, enclosed and uninviting. Views to the lake are obscured by the current tree arrangement and access is difficult. The concept design prepared in 2018 for the laneway upgrade proposes an accessible, safe and more inviting space that attracts people and more commercial activity. We consulted with the wider community from September to November 2018 on the concept designs and the final designs are now being prepared. 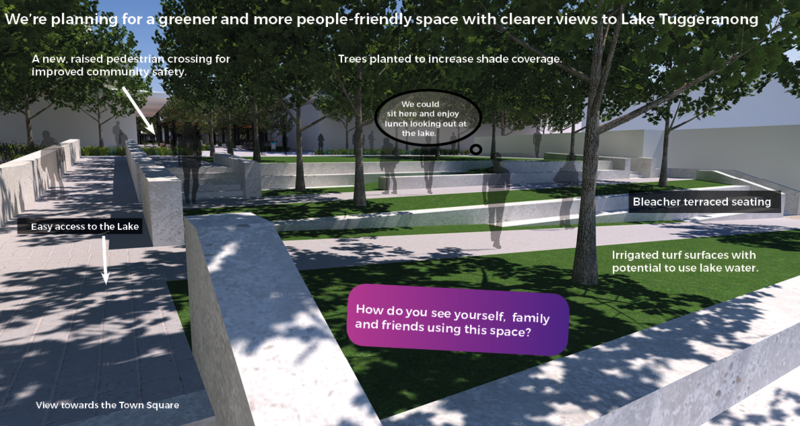 The feedback we received during consultation will help inform the final designs. a new grassed terrace area with shade and seating. Artist impressions of proposed streetscape improvements to be made at the laneway to Lake Tuggeranong. Anketell Street from TCCS on Vimeo. Concept designs prepared in consultation with key community stakeholder representatives.